Three years after the end of the Civil War, a chophouse called the Tidewater Trading Post opened in Manhattan’s Chelsea neighborhood. It served charbroiled cuts of beef, along with hearty sides and stiff cocktails. Sound familiar? 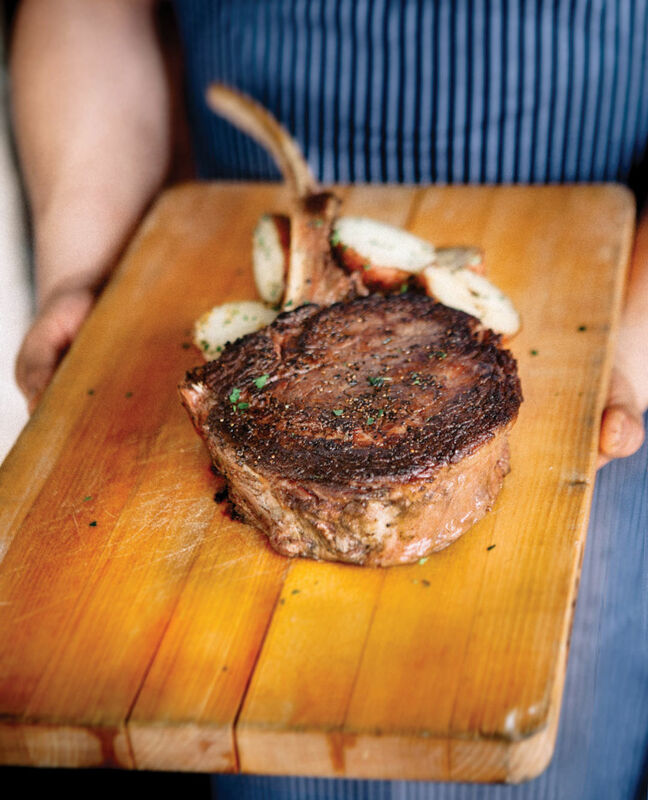 Now known as the Old Homestead, the country’s oldest steakhouse vastly influenced all that came after it. For almost 150 years, steakhouses have remained bastions of hunter-gatherer manliness (even as women were eventually permitted to dine in them), the Tidewater’s template—dark-wood-and-leather, cigar-smoking boys’ clubs, the dishes served therein—rigid and constant. And there’s a good reason for that, most restaurateurs would argue. It works. Still, steakhouses are at least tinkering with the formula these days, if only for the sake of the modern diner steeped in small plates and sushi. The slick look of the Pappas Bros. Steakhouse downtown location, which debuted last November, is clearly aimed at attracting a younger, hipper crowd for old-school fare. And Killen’s Steakhouse in Pearland, which reopened in a new location just a few weeks later, seems to be going for something similar. 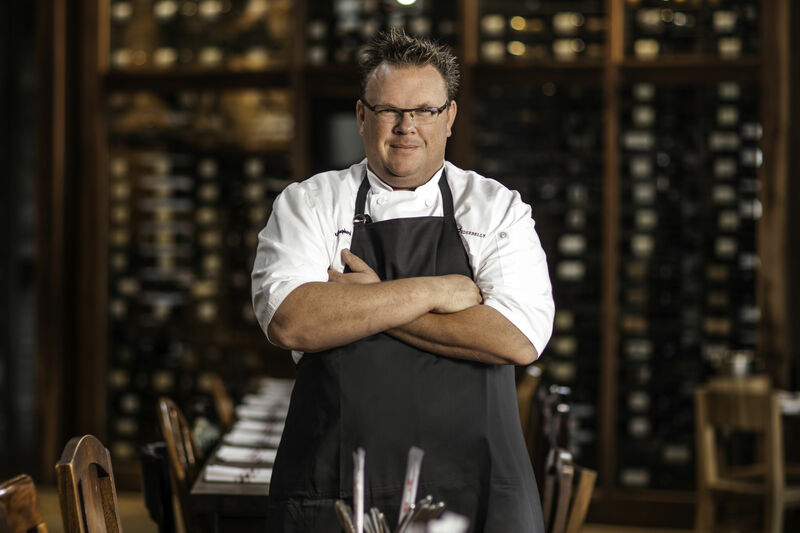 It boasts a sunken dining room surrounding a massive, blue-lit wine locker, and a separate, private dining room named for the owner’s favorite customer, Houston Texan JJ Watt. 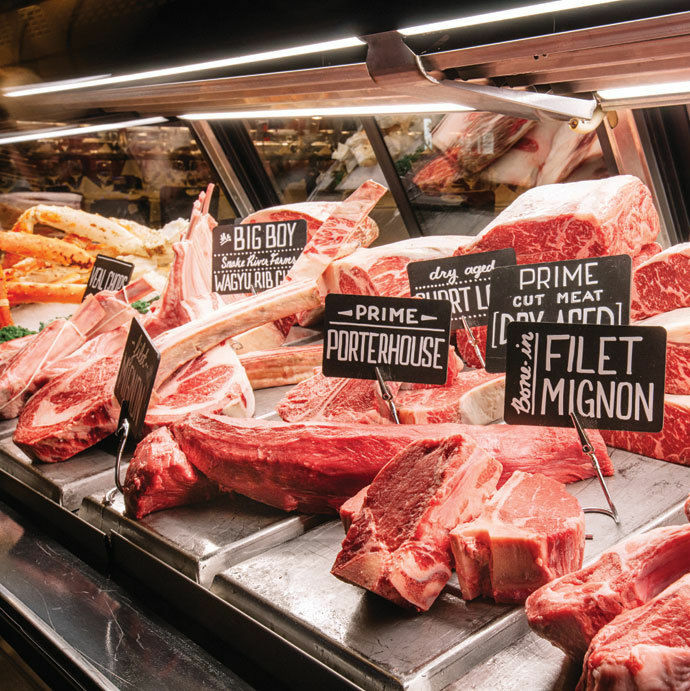 The enviable meat case at Pappas Bros.
Ditching the old hunting-lodge aesthetic is one thing, but what do you do about a menu that traces its roots to 17th-century hotspots for British businessmen? For its part, the Old Homestead has bowed to contemporary tastes, bringing yellowfin sashimi to the appetizer menu and flying in $350 slabs of wagyu from the Kobe prefecture. 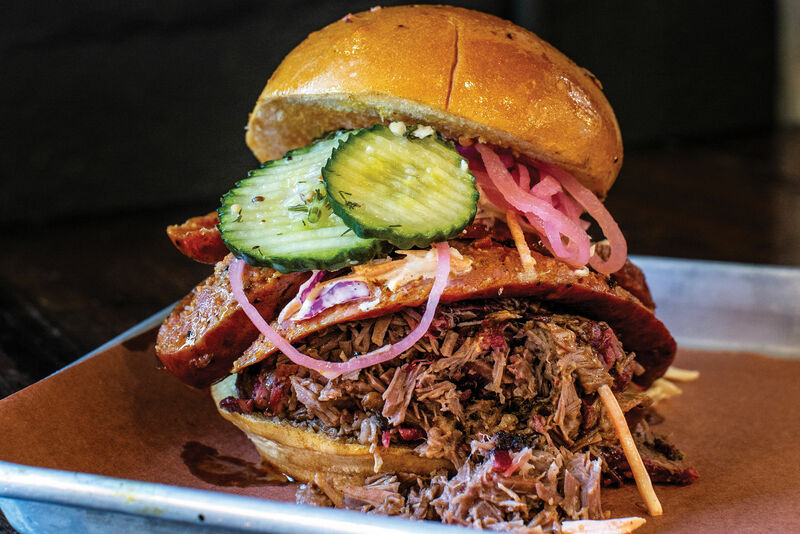 But while Pappas rarely departs from dishes Lincoln might have enjoyed after a cabinet meeting, Killen’s executive chef Joe Cervantez, under the direction of legendary Ronnie himself, looks to Confederate territories for inspiration. 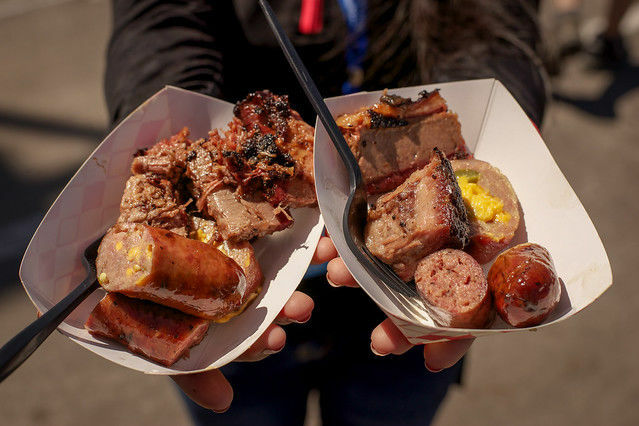 In fact, the best dishes at Killen’s aren’t grill-marked hunks of cattle at all. 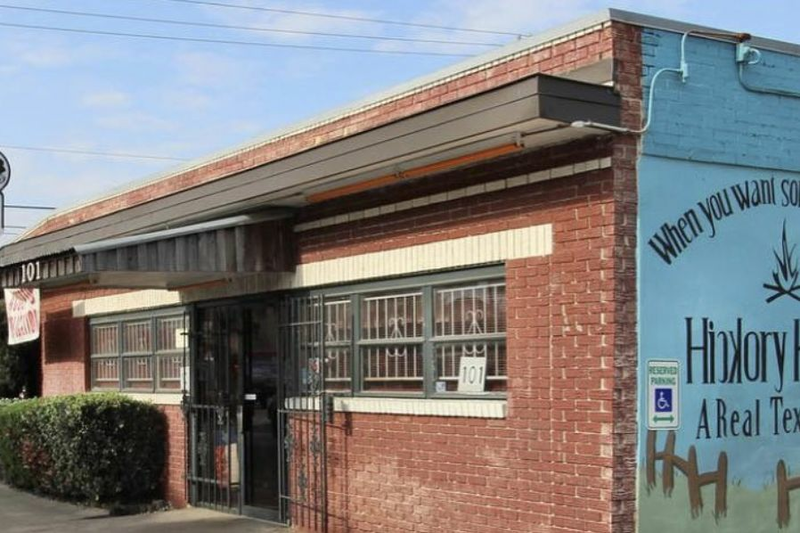 The menu’s greatest successes veer southward, toward the realms of both fine and roadhouse cuisine. Among the appetizers, slim chunks of seared foie gras melt atop butter-suffused toasts floating in pools of warm smoked-bacon-blueberry jam. On the side, peaches pink from pickling in sweet tea rest on greens to shed light on the deliriously fatty centerpiece. Mesquite-smoked Kurobuta pork belly, baptized with a sweet and tangy cherry-tamarind glaze studded with dried fruit, is served over mashed potatoes, and apt to fall apart if a light breeze hits it. And as for the fried asparagus, well, crunching into a thick, uncommonly meaty spear fried in panko crumbs feels like eating a chicken finger—a chicken finger covered in glistening chunks of crabmeat swimming in lemon butter, that is. 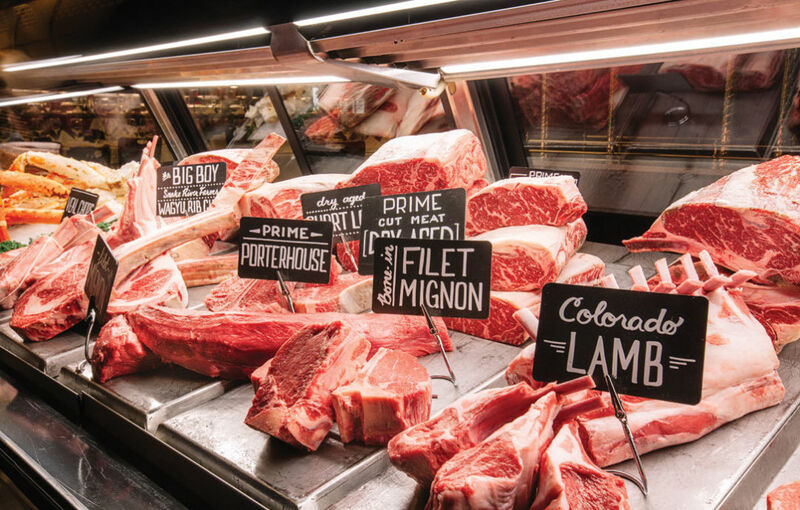 As at most traditional steakhouses, Killen’s prime cuts come à la carte, which means that $72 buys, say, eight ounces of very nicely seasoned Texas Akaushi filet mignon, but nothing else, which seems a bit steep for a steak without marbling as dense as typical wagyu. (The $46, 10-ounce version from California’s Harris Ranch is a better deal.) Those in the mood to compare and contrast might consider Killen’s $150 New York strip flight, which features four-ounce tastings from a quartet of different pedigrees. Somewhat surprisingly, the steaks I ordered all came to the table slightly underdone (at my second visit, a medium-rare steak was still cold in the middle), however the fried entrées are spot-on. 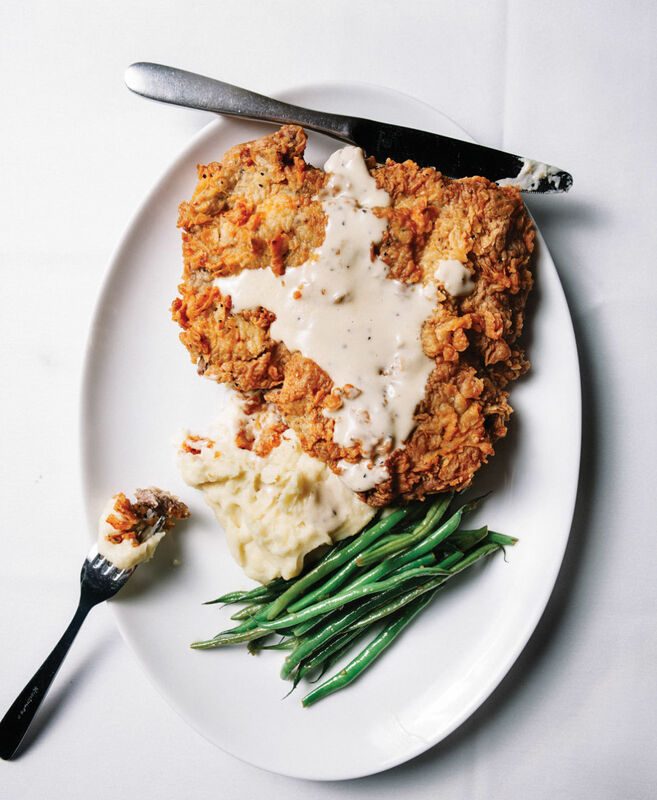 The standout is a $22, plate-spanningly massive chicken-fried steak—buttery prime sirloin with a batter that’s as light and crisp as fish-and-chips and crackles beneath a thick, peppery gravy. Fine-dining-smooth mashed potatoes are almost as creamy as the gravy, and haricot verts maintain just the right amount of crunch. The sides, priced at $8 and $10, are plenteous bargains, and there’s not a loser in the bunch, from broccoli-and-cheese risotto (a disarmingly subtle interpretation splashed with white wine) to creamed corn (rich and sweet enough for dessert if not for its kick of heat) to the chicken-fried-to-perfection onion rings. As most of Killen’s desserts aren’t on par with the joys of the flesh, consider finishing your repast with a drink instead. The cocktails, created by Deanna Killen (co-owner and Ronnie’s ex-), lean heavily on house-made ingredients like pecan orgeat, which figures in a craft concoction known as Nuts & Bolts. 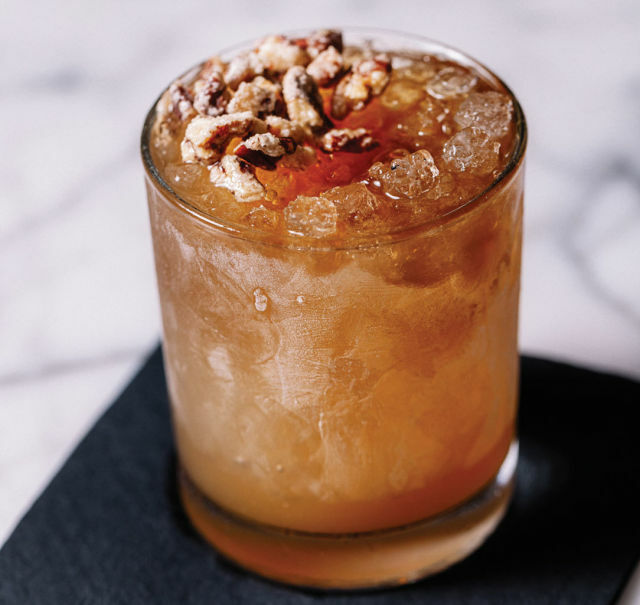 Combining Baker’s Bourbon whiskey with Coca Cola, the cocktail could easily sub in for a slice of pecan pie—it even has candied nuts floating on top. A menu with such vim would suggest service to match, but alas—Killen’s wait staff, low-energy and disinterested, left our table unattended for long stretches at each visit. This would never happen at Pappas, where servers are so attentive it can sometimes feel burdensome communicating with them. And communication is no easy feat, especially for those whose voices can’t stand up to an evening of shouting over a mass of other voices. Having traded fusty trappings of dark curtains and low ceilings for a bistro-like atmosphere, Pappas has created a room so noisy that it’s near-impossible to converse—or order—without the aid of a 19th-century ear trumpet. The menu mostly inhabits a similar era, as I say, which is not a knock. Portions are enormous, from a Caesar salad my dinner companion pronounced “bog standard” to a plate full of onion rings the size of one’s head. I half expected Boss Tweed to emerge and demand a bowl of the sherry-spiked turtle gumbo. Lobster deviled eggs at Pappas Bros Steakhouse. And yet some of Pappas’ greatest successes come when it too departs from steakhouse repertory. Lobster deviled eggs combine a trio of ingredients— eggs, lobster and bacon—often cooked less than perfectly in restaurants. 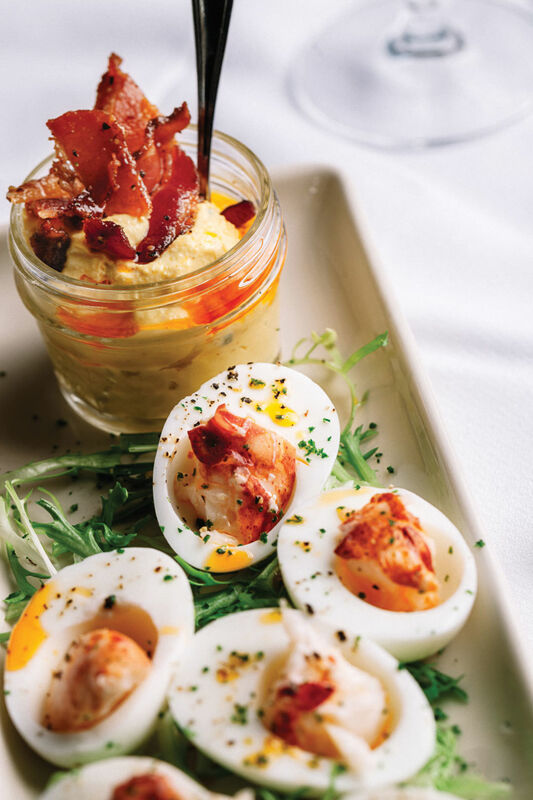 All are done with precision at Pappas, but the trick is in the fun presentation: Diners are served hollowed-out egg whites stuffed with lobster chunks, then invited to complete the dish by spooning out a tangy, silken yolk mixture dotted with crisp, peppery bacon. Steak au poivre, while a bistro classic, isn’t found on most steakhouse menus. I hope it never leaves Pappas’, however. The three-peppercorn sauce is rich in both flavor and body, not to mention a welcome respite from the melted butter greasiness that mars some of the other steaks. The “Big Boy,” a Snake River Farms wagyu rib chop that turned out to be far more fat and bone than flesh, was especially problematic. Adding insult to injury, a server carved the steak from the bone tableside into two grisly slabs, rather than the elegant slices we expected. Next time I’m looking for an on-the-bone cut with a hint of refinement, it will be Pappas’ bone-in filet mignon, a steak that should be far more common in Houston. 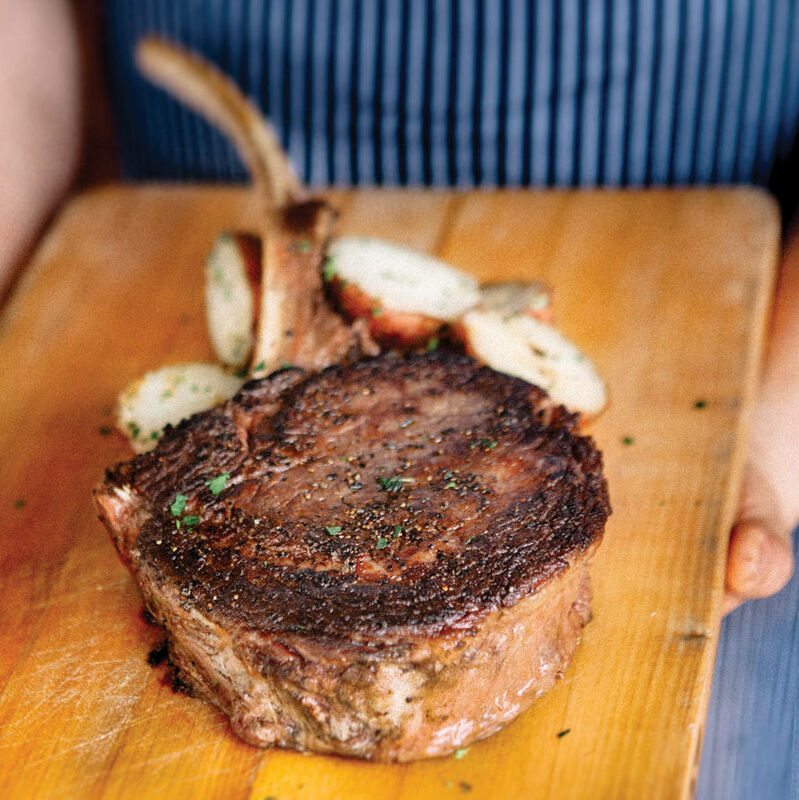 (Think of it as a filet with flavor, or the smaller, more tender half of a Porterhouse.) Pappas has a $59.95 version that had me stripping the prime dry-aged meat from the bone like a savage. A side of indulgent creamed spinach sweetens the deal, although I’ll avoid the overcooked green beans in the future. Even if the cocktails aren’t as ingenious as Killen’s, I’ll also skip Pappas’ desserts in favor of a drink—perhaps the Market Square Mule with its house-made grenadine and chile tincture. And if I must order a sweet, it will be a second taste of something highly traditional, such as the oversized skillet of warm peach cobbler with vanilla ice cream melting over the top. 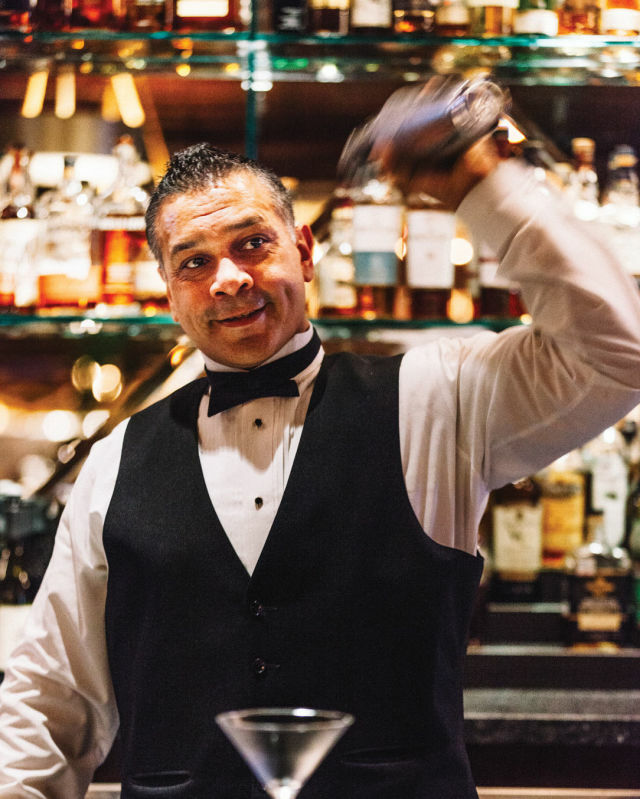 After all, as with steakhouses, some things remain unchanged for centuries with good reason.